Vladimir Tatlin was born on 28th December 1885 in Moscow and died at the age of 67 on the 31st May 1953. Vladimir and his family moved to eastern Ukraine, to a city called Kharkiv when he was 5 years old. Vladimir started out as a sea merchant, and then started attending the Moscow School of Painting, leading to an architecture and painting. He became one of the most important artists in the Constructivist movement. Before that in the 1920's he was one of two most important people along with Kazimir Malevich in the Russian avant-grade art movement. 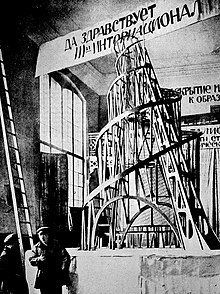 Tatlin become a famous architect and made a name for himself as the architect who designed a tower known as the Tatlin's Tower. Planned in 1919 the tower was going to be a third taller than the Eiffel Tower in Paris at 400 metres high, the construction of tower would have included iron, steel and glass. Inside the tower would have had two steel twin spirals, helping with structure and the design would of envisaged three shapes, which what would of been covered with glass panels, these shapes would all rotate, but at all different speeds. The tower was supposed to be a symbol of modernity, large enough to challenge the Eiffel Tower. Tatlin's work shows a traditonally representational type of art and used this to put it onto new more practical issues. This, along with his desire to put his art in the service of the Russian Revolution and to express his art in a way of life in the twentieth century, Tatlin's art played a big role in the transformation of Russian art in-particular practical design. Tatlin's training as a painter played a huge role in helping him how to use unusual or different materials in his painting, but his encounter with Picasso's Cubist collages which he came across on his trip in 1913 to Paris, was the most important aspect in his painting. "The investigation of material, volume, and construction made it possible for us in 1918, in an artistic form, to begin to combine materials like iron and glass, the materials of modern Classicism, comparable in their severity with the marble of antiquity. In this way an opportunity emerges of uniting purely artistic forms with utilitarian intentions. An example is the project for a Monument to the Third International." "Not the old, not the new, but the necessary." Above is a small model of the tower Tatlin became famous for.